Exif Image Inspector - Phatch = PHoto & bATCH! 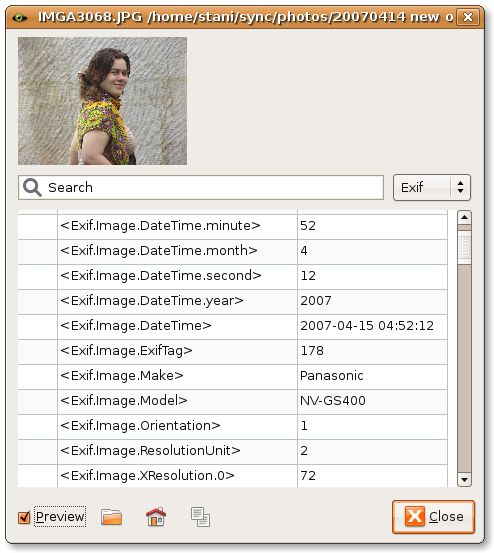 Phatch is designed to support multiple exif tools, as not all are easily available on all platforms. In the first phase Phatch will start with pyexif2, but later others might follow (such as exiftool). You can launch the image inspector to explore exif or iptc tags from the toolbar or the Tools menu. It starts empty like on the left. Above you have a search bar to filter the tags and next to it you can select the tag category. Below you can enable a thumbnail preview of the image and you will also find a series of image buttons: open image filename, open image url and copy cell text. 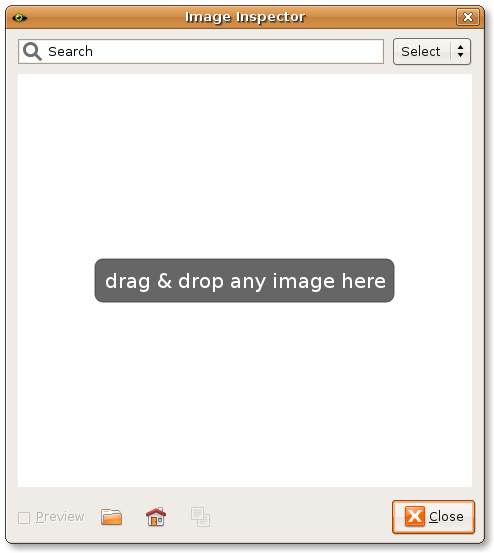 You can list the tags of any image by pressing one of the open buttons or by dragging and dropping it on the inspector. You can open as many inspectors as you like. They will always float above the Phatch window. 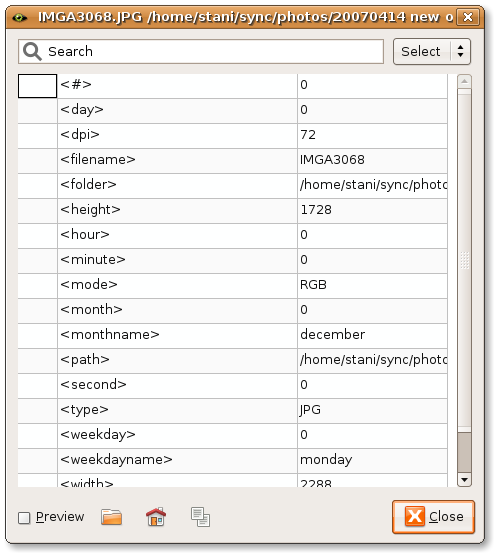 As soon as you open a file in the image inspector, it will show a list of variables that every image has. You can filter the list by typing some characters in the search box above. On the right top you can choose which category of information you want to see. By opening an image the Copy button gets enabled. When you click in a cell of the grid, you can afterwards press the Copy button or Ctrl-C (Cmd-C for Mac) on your keyboard to copy the value to the clipboard. This is handy as you can use any value in the action parameters. You can use for example these variables in the Save action to save your files in specific folders. By using the top right select button you can navigate between the different exif categories. You can read more on the variables page. If you click on preview you will see a thumbnail of the image. "It is designed as a high level interface to the functionalities offered by exiv2 (and is built on top of it). Using python's built-in data types and standard modules, it provides easy manipulation of image metadata." If you are lucky there are easy installers available, like for Debian and Ubuntu.